The most known and appreciated salami of the typical products of Calabria is with any doubt “’nduja”, that is a spreadable meat with a spicy taste. It is a cured meat of pork that comes from Spilinga, near Vibo Valentia, but now nduja is produced almost everywhere in the province. Well appreciated is also Sopressata Calabrese, salami made of pork meat and fat seasoned with chilli pepper and fennel. Then, there is Salsiccia di Calabria DOP, Capocollo calabrese DOP, bacon and Guanciale. Salame pezzente or Nnuglia instead is a typical product of Basilicata and Calabria made with offal and flavoured with belt pepper and fennel. As the majority of the southern regions, also Calabria proposes a great choice of typical cheeses. Try, absolutely, Butirro a stringy cheese that has a creamy stuff of butter. We have also a series of excellent pecorino as Pecorino Crotonese, Pecorino di Vazzano, Pecorino dell’Aspromonte, Pecorino Caciocavallo Silano DOP and Caciocavallo di Ciminà. Other typical cheeses of Calabria are also Caprino della Limina, Provola Calabrese, smoked Ricotta, Ricottone Salato, Strazzatella Silana, Cacioricotta and Caciomulo. The art of making bread in Calabria is one of the most ancient and worth mentioning arts of our country. To start, it is possible to taste the bread Cerchiara, prepared according to natural leavening with soft wheat flour and bran. It is well recognizable for its round shape with a small bloating on one side. We can find also Pane di Cutro that is kneaded with a mix of flour of soft and durum wheat. Another product of excellence is also the famous Pitta, a kind of bread with a round shape and flattens, then it is covered with oil of Calabria in the surface. In Easter, instead, people cook Sguta bread stuffed with eggs. Like Sicily, also Calabria is characterised by an important and high quality production of fruit and vegetable. We can find Arance di San Giuseppe, a sugary variety, picked between February and June. Similar, are also Arance Biondo Tardivo di Trebisacce picked in spring and are the best fruit of Calabria. Then Clementine is another type of tasty citrus, so that Limette calabresi, Pompelmi di Lamezia Terme and Cedri Diamante. The wine tradition in Calabria has been consolidated during the centuries, and today Calabria produces at least 10 million bottles per year. Among the red wines we can drink Arghillà or Bivongi Rosso, typical wine of the ionic area. 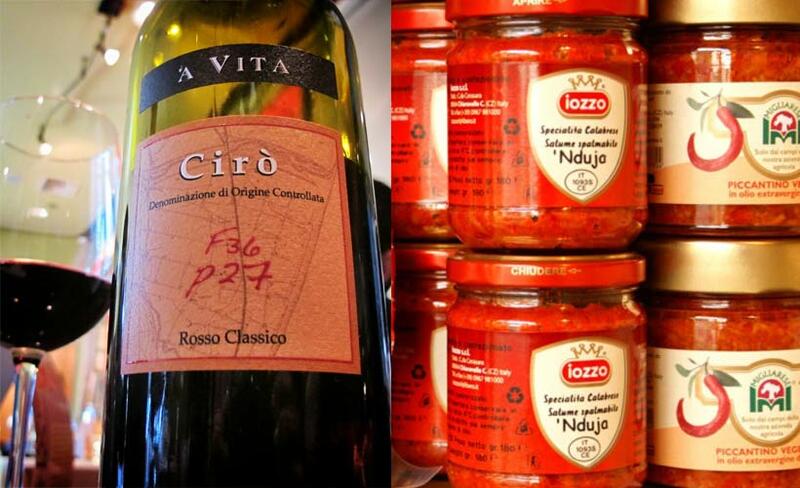 The most popular wine of Calabria is Cirò DOC, refined with a warm and well structured taste. The best white wines of Calabria are, instead, Bivongi Bianco, Donnici Bianco, Greco di Bianco, Lamezia Bianco, Moscato di Saracena, Scvigna Bianco and Verbicaro Bianco. Also the confectionery of Calabria gives us a wide choice of great desserts. For instance, there is Mosticcioli that are pastries made with flour, honey, liqueur and different aromas. During the carnival period, then, people prepare Chiacchere, strips of fried or backed pasta sprinkled with powdered sugar. Don’t miss then Corcchette di Fichi Secchi, Cannariculi, Cupeta, Pignolata, Riganella, Tartufo di Pizzo and the Susamelle. Pretty taste is also the nougat of Calabria, prepared according to the typical traditional recipe.